Designed as a feasibility project for a private client in London, the Scooter Showroom was a chance to create a space that perfectly exemplifies a brand. As a practice, Hadfield Cawkwell Davidson has always been intensely interested in the link between a company’s brand and its material implementation within a space, building or city. As such, taking a company such as this and thoroughly exploring the look and feel of that brand was an incredibly exciting prospect. The scheme was developed as a stand-alone store with potential to be a pop-up store in other major shopping centres across London. Utilising a combination of exposed brick and gloss laminate walls we were able to create a space that glowed with suffuse light, the block coloured walls echoing the gloss finish on the scooters themselves. Colour choices across the whole project were dictated by the colourways of the vehicles and the major challenge in the interior design of the space was not to overwhelm the customer and instead scatter these pastel tones across different surfaces and objects. 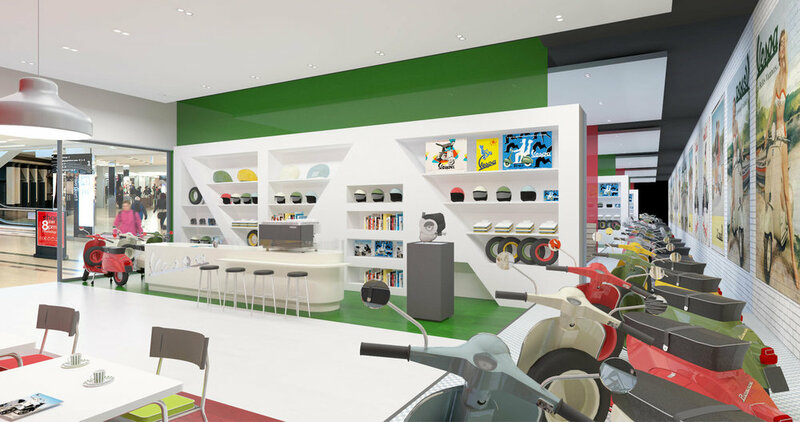 The viewer is left with the iconic Italian flag across the two feature walls and floor, peppered with the colours of the brand. With so many well-known and celebrated posters and pieces of memorabilia associated with the brand, the scheme could have become a cluttered collection of objects. However, by carefully curating the items and images used we were able to create a space that was visually stimulating but did not bury the viewer in a flood of souvenirs and other ephemerae.